you have even the smallest of holes in your roof or soffits, rodents can easily squeeze or chew their way into your attic. While they settle in, they’ll have no problem damaging your insulation or wiring in the process. 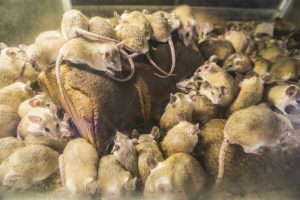 Here is what you need to know about rodent infestations to protect you, your family, and your home. Squirrels – As the largest of the most common rodents we see, squirrels can do a lot of damage when left alone in your walls or attic. Their large teeth always need something to chew on, like your walls, wiring, pipes, or precious belongings. Mice – They’re small but tough. If mice are left alone to nest, they can almost triple their quantity in a matter of weeks. The larger your infestation grows, the harder it will be to get them out. Rats – They love your attic because it’s safe and warm, and has plenty of nesting materials for them. Unfortunately for you, those materials are hard to get to, so rats need to chew through your drywall and other obstacles to access it. When you hire the professionals at Critter Control® of West Palm Beach, you can rest assured you’re getting the highest quality of service in the area. With more than three decades of experience, we’ve perfected our tactics to guarantee you quick and safe removal of any unwanted critters in your home. To schedule your free consultation, call us today at 561-274-0224.